Hello Everyone. 12.10pm in the UK and I'm looking at a problem. I have been given a lovely quilt for Project Linus UK and its your flag. At some point it has been damaged and a small repair has been made on the far right on a red stripe. You probably can't see it in the photo but the repair itself is now in need of repair. The hole goes right through but I can label it to cover the reverse. So the question is - what kind of appliqué could be used to improve the situation. It can be a fun patch or a serious one, it really doesn't matter. Is there a national flower possibly? Suggestions please. Many thanks Jacki. Not sure if I have actually managed to attach photo - still learning! I would do just what was done before as it preserves the integrity of a national flag. First thing that comes to my mind is an eagle...our nat'l symbol. Could you do that? ditto that. I think the only thing I would use would be the color red to cover it. Can you show us a close up of the damaged area? OK..I was able to click on the picture and I think I see the problem. Is the seam coming undone and a bit of the white is fraying? If that is the problem, I think I would slip stitch the seam closed by hand. Then I would get some fray check or fabric glue and tuck the frayed threads under with a toothpick. If you hold it down with tweezers or something , you can hold it in place a few mins until it sets. I will look at the picture again and see if I can see anything else. I would suggest an Eagle or if you can find one, possible a statue of liberty or mt rushmore - probably hard to find those though. If you want it to be less obvious, you might be able to put several small appliques around the edge so it looks planned. You could do an eagle, a liberty bell, Washington Monument, Statue of Liberty, Uncle Sam, etc. If you need more ideas, I'm sure Google will have millions. How about stitching a matching red and white strips of fabric together(or similar). Then cut out a star shape with the seam running through the middle. You could then appliqué the star in place matching the seam lines and it would be hardly noticeable but if you did look it would be in a neat star shaped appliqué. I enlarged the picture & was then able to see the repair. I think the easiest thing would be to appliqué an eagle. Good luck with it! There is already a strip of stars across the top and the bottom, so another down the side would not be unusual. I added a large appliqued star to a patriotic quilt that had a rather big hole. It looks great. I used muslin but it looks like you can use white. Gals, I don't mean to be a wet blanket, but am wondering if our flag is appropriate for the Linus Project. Aren't these quilts given to small children who will drag them about? I am not sure a small child will appreciate or care for our flag. Is there another situation wherein this flag repairs can be made and then displayed for what it represents and kept from harms way? I agree with Suz. Google uses for the American Flag and see if there are guideline to ensure respect for the flag. I have extracted parts of the "U.S. Flag Code" below. I don't think this is an appropriate quilt (if used for bedding) for Linus or any other project. Perhaps using it for display would be a more appropriate use for this quilt. Thanks for doing the research. I did the same thing after I ended my first post and found the same information. American flag should not be used for bedding (i.e. blanket). There are rules regarding the handling of our national flag. One of them being it is not supposed to touch the ground. If one does, it is to be destroyed. As former military and a patriot, I dont like the idea of it being drug all over the floor, wadded up and drooled on. If it is the seam fraying apart I have opened the seam further and fused some more fabric to it so there is something to sew. Then fray check it. Tartan's idea is great, but I also like Lisa's idea of applique around the edges so the one wouldn't stand out. I hate to be a killjoy, but I believe there is a law against "defacing" the flag. What you are purposing to do certainly isn't defacing, but it changes the flag from its original design. I will do some research and let you know for sure. According to flag etiquette we are not to draw on or change the flag's appearance. That said, what you are going to do is to enhance the flag and that certainly doesn't show disrespect. I regularly repair the two flags we fly each day, just resewing the seams that come apart from the wind whipping it around. I would liken what you are doing to adding a picture of the Tower of London to the Union Jack, it certainly isn't a sign of disrespect. Anyway that is probably way more than you ever wanted to know when you asked a very simple question. No applique, just fix the seam and tuck all inside. So much to do so I'm just needling around! If you think you could make the patch look close enough, you could print, stencil the Declaration of Independence, or even the Gettysburg address. That would pull the eye away from a 'glaring patch' to something that fit. Also the Natl. Anthem (song) would be another suggestion, it is actually about the flag. Another suggestion would be a lincoln drape--that would be like the swags that are often used on the 4th of July. Make what you are comfortable doing. 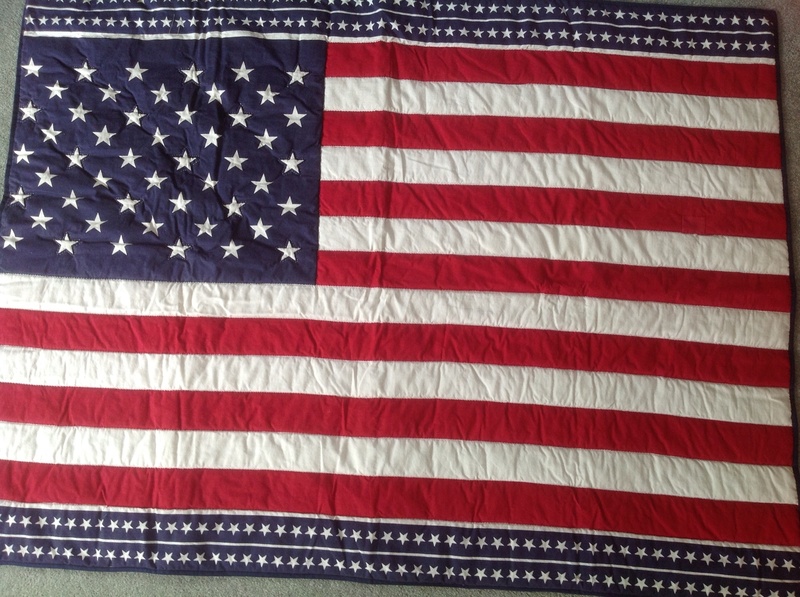 Our Quilts of Valor are actually not supposed to be images of our flag. Images relating are ok, but not the actual flag.